March Update: TREB announced Toronto condo sales were down 5.7% in February 2019 yet prices rose 6.1%. The average price of a condo apartment in TO, rose to $612,488 and to $448,711 in the 905 area code. 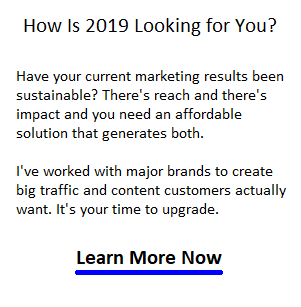 The forecast for 2019 from most experts is moderation in sales. It’s in the area of condo prices where their estimates might fail. With subdued availability, and unceasing demand, prices can only climb as they have been. Although availability is an issue all over North America, the issue is worse in the Toronto housing market. 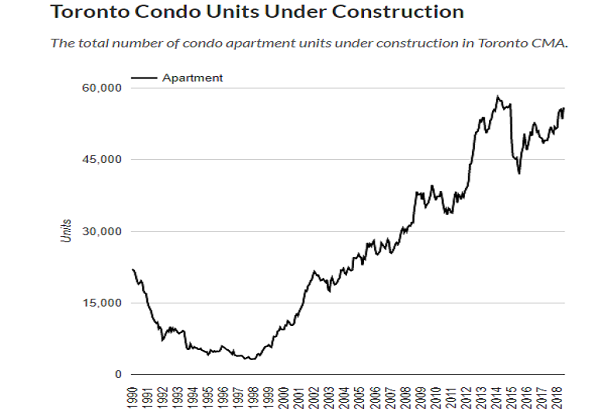 The antipathy to construction, growth, and the existence of big debt paints a pessimistic picture for the Toronto Condo market. Renters might be hopeful of a lower priced expanding rental unit pool, will likely be disappointed for yet another year ahead. The bright spot however is the Toronto economy which has somehow established a job creating niche in the North American economy. In a province of disappointment, this is a bigger story than most realize. Buyers in Toronto have turned to the condo market as an alternative resource to the Toronto single detached home market which is priced much too high. Most purchase in the Toronto GTA area are condos. The demand for condos comes from Millennial tech talent wanting to work close to the downtown core. Take a look at the condo prices throughout the GTA region below. The average price of a condo apartment increased by 8.3% YoY to $516,086. Frustrated millennial buyers may have more saved for their downpayment, yet still can’t negotiate the big prices. The huge Toronto condo market, the market is woefully inadequate to fulfill demand. The fact is Toronto is growing and condos will be in continuous demand. It’s all about mortgages and price. The mortgage stress test rules should be abandoned by the government, yet Canadian debt is a big worry. Canadian consumers are on the edge and cannot survive a recession. Which is why many hang on the news about trade with the US and China. It’s a terrible situation the Canadian government has pushed Canadians into. With no confidence themselves they could be literally pushing Canada into a recession. Constrained supply is causing everyone endless misery. With prices so high, no purchases can occur and therefore no economic boost occurs. Prices in Toronto city districts have seen big price increases since one year ago. The precipitous drops in Oshawa condo prices is due to the troubled Canadian auto sector, with GM deciding to abandon its Oshawa plant. New auto production companies are interested in vacancy and trained workers, however GM may put the kaibosh on competitors. The new mortgage rules now enforced means many buyers will only qualify for a much lower mortgage. Still buyers are eager to purchase as seen in the new construction condo sector. It will be some time before new construction can save the day. You likely have your own opinions about government meddling in the markets, however such interference can be a housing crash factor in itself. Should you invest in a new or resale Toronto condominium? Given the election uncertainty, and rising unemployment rates, you should be certain. The negativity in the Canadian economy is a key reason the Feds have pushed the stress test red tape so strongly. They don’t believe things are going to go well. They’ll need more creative mortgage financing and improved condo searches to find condomium they can afford in Toronto. To save they might have to search further to Brampton or Ajax. Although the mortgage changes in 2018 will put an extra burden on them, and force them to stay in the rental market, they will likely have more money in the spring to buy a condo. There’s big investor demand for condos too. Student housing is in a severe crunch in Toronto and Vancouver. Investors are well aware of the rental potential of condos and many may be investing in the Vancouver condo market and here in Toronto because of so much rental demand. If you can’t earn a profit on capital appreciation, you can still make it on rental income. As you know in markets such as Florida or California, condo rental markets are hot. The ROI is significant and rental property investment is always a hot ticket in markets with perpetual low housing availability. The Toronto condo rental market is worth a look. 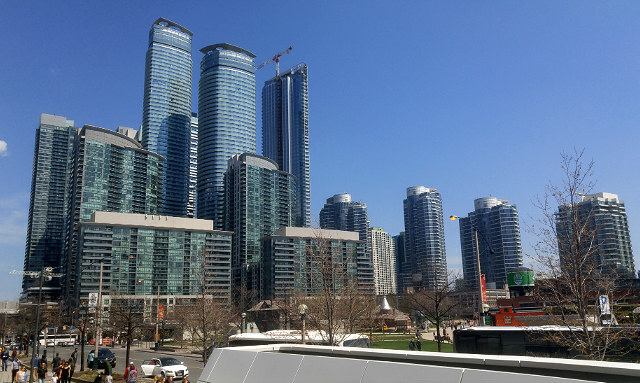 A report from BNN shows how rental income properties, including condos in Toronto. See where the big rents are. Why are Toronto Condos such a Draw? Toronto Condos offer higher cap rates and a larger growing pool of potential renters and buyers. And at this point with severe shortages of detached houses and townhouses, buyers are buying condos. Barry Fenton, President & CEO of Lanterra Developments, a major condo developer suggested Toronto Condo prices could could have risen 40% and they still are rising. When foreign investors look to escape their own country’s currency nightmares and leverage our weak loonie, they like the Toronto market. Note: If you’re a foreign real estate investor, people often refer to Toronto as being the greater Toronto area encompassing Oakville, Mississauga, Vaughan, Richmond Hill, Scarborough, East York, Pickering and even out to Oshawa. The Newmarket, Bradford, and Aurora regions are included in TREB’s housing sales reports. Barry Fenton, President & CEO at Lanterra Developments joins BNN to discuss the Toronto Condo market. He suggests the market is aggressively priced and complains a little about how competitive it is. He says prices will rise 40% but he has a few misgivings about the Toronto Condo market. Most home buyers in the Toronto area can only hope to own a condo. Homes are averaging over $1.5 million in some areas in the GTA. And condo developments are offering more for tenants. And perhaps the key feature of Toronto condos is their proximity to work, leisure, restaurants and shopping and freedom from the grinding commute that many Torontonians face each day. So there are good reasons to buy a condo in Toronto. Oddly, the condo market in Toronto is much less volatile than the single housing and townhouse market in Toronto. Her foreign buyer tax and rental price controls look like they’ll miss the mark. Where are Toronto’s Best Investment Condos? As the graphic above shows, the top location is Toronto Central (where home prices are highest too), Toronto West and Mississauga. The bulk of these listings are in huge mega-sized condo towers and there are more of them being built. Toronto Central is also close to the U of T, Ryerson, and other colleges where off campus housing is in hot demand. It’s the same situation for Vancouver condo rental and investors should take note. Toronto’s C02 district is your million dollar listing area. With an average price of $1,050,000 these are your Toronto luxury condos. This area is located just north of Downtown/Bloor st, near the University of Toronto. This suggests that proximity to U of T and downtown offices may be the primer driver of Toronto condo prices. What are the Predictions for the Toronto Condo Market? Urbanation says Toronto condo rental rates will shoot up another 11.2% . That ridiculous might tell you that condo prices themselves will be rising in 2019 and 2020. The shortage will begin to show and if a trade agreemen is reached with the US, prices could rocket. Should I Buy a Condo in Toronto? Should you buy a condo in Toronto, Mississauga, Scarborough, or Brampton? As we’ve seen in the Toronto housing report, demand for condos arises from a lack of traditional single detached family homes. Toronto is crowded, and politicians are not saying they will solve the crisis. That means there likely will be intense pressure on condo availability and prices. For income rental housing and condo as investment for Toronto’s workers, the value seems obvious. This lull in the market is temporary and the upward race will begin again. Need an experienced Realtor to help you find the right property at the right price? Ask Damir Strk your questions and get reliable answers. All the rent controls are making it impossible for small landlords to break even. Now the tenants are trying to take away the landlord right to ask for capital expenditure rent raises. How can we protect ourselves as landlords.